How do I set up a therapeutic garden? 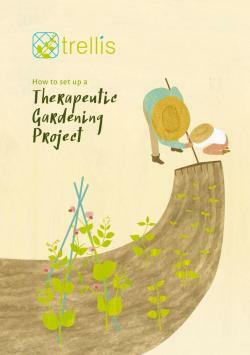 Loads of practical advice, signposting and support from the Trellis network in one illustrated volume. Receive a free copy of this 'Trellis guide', reduced rates on Trellis events and selected garden supplies with Trellis membership. How do I start working in this field? How can I find projects in my area? Locations of all the projects along with contact details can be found on the network map. Projects across the Trellis network are often looking for volunteers. If you have some time and skills to share with others please have a look at the volunteering opportunities listed on our volunteering page or contact gardening projects directly via the Directory of Projects. If you can't see any projects in your local area, then please email Jenny at the Trellis office (jenny@trellisscotland.org.uk) who can suggest further gardening projects that encourage volunteering. Here in the Trellis office we also need volunteers from time to time to help with administrative, website or fundraising work. Email or call to find out about current opportunities. "It's really helping my concentration." "It's nice to feel useful."